The world of Islam and the Middle East region have been grappling with intense identity and security challenges in recent years. A large number of incidents and developments in this region, whose sources exist either inside or outside the region, intensify internal conflicts among Muslims, while lack of correct understanding of the quality and nature of these developments has caused any incident and mishap in Islamic countries to become unmanageable and get out of hand. The recent incidents during the huge congregation of Hajj in Saudi Arabia, the gravest of which took place on the auspicious day of Eid al-Adha and concurrent with the presence of Hajj pilgrims at Mina, rapidly turned into a challenging topic in relations among Muslim countries due to their scope and the profound dimensions they had from humanitarian and Islamic viewpoints. For this reason, it seems that regardless of many marginal issues that are brought up by the media, the most important priority for dealing with this incident is recognizing its depth and scope. Of course some experts have endeavored through review of the history of Hajj incidents in past years to uphold the idea that what happened in this year’s Hajj pilgrimage is also an ordinary and natural course of events with the only difference being the high number of dead people in this incident as compared to previous ones. In line with this effort, they have emphasized that similar incidents took place in 1979, 1987, 1990, 1994, 1997, and 2006. 5. Absence of a reaction commensurate with this disaster from Islamic countries. Therefore, it is quite evident that Saudi Arabia’s management of the Mina disaster should be made subject to prosecution and investigation from political and legal viewpoints because it seems that this issue will have a great impact on recognizing the depth and scope of the Mina disaster. 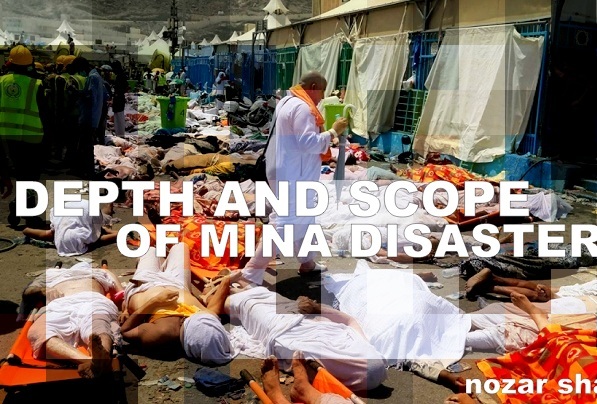 Without a doubt, more serious follow-up by Islamic countries on the Mina disaster is among righteous demands, which should be met through various means and with necessary ingenuity. 3. Creating a global discourse on the necessity of the participation of all Muslim countries in the management of Hajj rituals.